Not this month, rather four months ago! Time has a habit of getting away from you, and so it is with this final reflection on Georgia’s culinary landscape. This is the final chapter in that story, more for the record than the instant buzz of hot news. The story goes nowhere without some bread to start it off. Bakeries in Tbilisi are small, sometimes below street level, with top-opening brick ovens partially buried, run by one or maybe two people, who sell the bread directly from windows open to the street. The traditional bread is long, pointed and arced into a crescent shape by the circular oven in which it is baked. It is crunchy on the crust, chewy in the crumb and quite salty. Sold hot from the oven, it is unlikely to make it very far from the shop. Which is, I suppose, why people buy a lot of it, every day. This sprawling market surrounds a modernist structure, with a narrow red brick building defining the northern boundary. Traffic barely moves, the commercial pace is bustle-brisk. The fresh produce, many of the spice sellers, herb sellers and hardware sellers encircle the site on the outside perimeter (a word I use loosely: it’s boundaries are defined by the place you will find the last stall). In the narrow brick building, on two levels, are the meat, cheese and flour markets. The vast, open centre, the modern building, is well - largely empty, devoid of life. There are some wholesale operators, but not much else. This structure was the genius idea of the first post-soviet government. Get rid of the old building, which were occupied free of rent, build a modern facility - then charge the producers rent to sell their goods. The upshot: everyone moved outside, took their wares with them - and their pirated power supply - and set up shop again: rent free. And the merchants are the heart of the market. For the most part, open and friendly, willing to be engaged, to offer a taste and to explain. There is on occasional display a certain tourist fatigue: this is a subsistence living providing for the most part an affordable source of food for local consumption. The constant flow of tour groups and cameras and the sense of being on display for very little return grates on some. It’s a more interesting place for all that history, and retains the connection between the farm and the produce that a commercially constrained premises would likely have interfered with. And of course, there were the restaurants. The story would not be complete without a shout out for the restaurants I visited. In seven days, four of these stood out by any measure. Here, all I had read about the traditions and innovations were on display: herbs in abundance, bitter flavours promoted by fermented and sharp fruit sauces. Nut-based oils and cooking techniques building body with ground nuts as opposed to the dairy and flour-based alternatives the western palate is used to. Set in a courtyard, bordered by a verandah, the casual ambience belies a dedication to traditional food, impeccably prepared and presented. Open a scant six months when I visited, with a 23 year old chef, her food was assured and innovative: introducing new flavours to traditional techniques, marrying a tahini peppery sauce with herb-stuffed grilled aubergine and roasting chicken with mustard and lime. Sublime! This is the restaurant that brought to Tbilisi the influence of the Pheasant’s Tears winery, one of the first in Georgia to gain a reputation abroad for its revival of modern Georgia’s culinary traditions. An extensive natural wine selection plays beautifully off the sophisticated menu. And so, as in life, all good things must come to an end. Interest sparked in Moscow; interest deepened by two recent books on the food and wine culture of Georgia and the Caucasus; expectations of a day exploring the Kakheti region’s farm to table offerings high. The first glimpse of Telavi market sends a tingle of excitement down one’s spine. An unassuming street entrance, guarded by a woman selling pickled walnuts, leads into the space. Passing the butcher with the best chops (and good pork too! ), you are confronted by a flight of steps leading down into a cavernous covered market place, with its steel and glass structure looming overhead and providing a muted light into the hall below. Every inch of space on the way down is filled by spice merchants, bakers, confectioners, herb sellers. In the main hall itself, their numbers multiply, and in the apparent chaos of stalls you realise that there is order after all. Aisles are organized by produce: spices such as adjika and svanetian salt, marigold and blue fenugreek; sauces such as tkemali; confectionery such as churhckhela; fruit and vegetables; cheese, often sheep’s milk cheeses, from the curds to young, salty hard cheeses and sheets in rounds so thin you cannot imagine how they are made; pickled and fermented peppers, garlic and jonjoli, the buds of acacia trees; nuts, often walnuts; and most notably herbs: vast quantities of herbs, from the recognizable to those giving pause for thought to the indigenous and as yet untried. Olia Hercules, in her book ‘Kaukasis’, describes one local herb, ombalo, thus: ”imagine marjoram and mint making love on some swampy marches and bearing a wild herb child.” By bringing this image into the meadows, she brings you close to what, at the end of the day, you recognize as a food culture that remains close to its origins in foraging and self-sufficiency. Unlike Western cultures where agrarian roots are often lost to mass marketing, genetic modification and lobby groups, you get the sense that many Georgians have never lost their connection to the soil. This sense intensifies as the day goes on and the food bought on the market is transformed into an alfresco supra, the traditional Georgian table of plenty. Between Tbilisi and the Telavi market and from there to Zangaura, the magnificent scenery in Kakheti unfolds: mountain passes give way to fertile plains; herds of cows and sheep wander together in open countryside, accompanied by a shepherd, sometimes on foot, sometimes horseback; vineyards begin to appear. There are stops at historic sites: Gomri was the capital of Kakheti until the 16th century; and there is the obligatory lunch of khinkali, Georgian dumplings filled with a variety carnivorous delights, or mushrooms. or cheese, or potatoes, at a restaurant overlooking Telavi. And then we arrive at Zangaura. This is Merab Bulzade, physicist by profession, winemaker by passion, with his 2,000 year-old qvevri discovered on his property. After the break-up of the Soviet union, he reclaimed his family land holdings in Kakheti, then gave up the sciences in favour of the winemaker’s life. In the vanguard of the resurgence of traditional natural winemaking techniques, several of his wines are fermented in qvevri, giant terracotta pots buried in the soil within his newly-built winery. There the grapes are crushed. The juices, as well as the skins, stalks and seeds, are decanted into these qvevri, where a natrual fermentation is induced by the presence of the solids in the juice. The first stage of the fermentation, up to six months depending on the grape variety, continues in contact with the solids, at which point the juice is taken off the lees and continues its fermentation for up to another six months. The solids are then used to make chacha, Georgian brandy. He has 40 hectares under saperavi vines, the most important of the red wine grapes grown in Georgia, particularly in Kakheti. He not only produces wines from his own grapes, but buys and sells from other winegrowers across Georgia. The result is a range of award-winning wines, from crisp, steel-fermented whites, to the intense amber-coloured wines resulting from the long contact required by the open fermentation process, to the deep reds typical of the saperavi grape. These wines, the whites in particular, are unlike the wines drunk in the west. Often tannic, not high in alcohol, they can be mouth-puckering at first. But they yield a long after-taste, lingering on the palate and evolving, offering complex flavours as they fade. And after a tasting in his cellar, under the trees and the sky in a meadow at Zangaura winery as the sun fades, nestled in the lee of the Caucasus Mountains on the Russian border, the picnic begins. Kristo and Georgi of Ezo Tours, equipped with the produce from Telavi market, demonstrated what it means to be treated to hospitality in Georgia. It centres round the Supra: a table laden with a never-ending supply of dishes, fresh and fermented, hot and cold, highly seasoned and redolent of the scent of herbs. The cuisine is direct, delivering tastes that are, to the western palate, sometimes astringent, bitter even. The techniques use added oils sparingly, and typically as a seasoning to finish a dish, relying often on nut pastes and their natural oils to thicken sauces and lubricate food as it cooks. Pork and beef predominate; cheeses are often of sheep’s milk, young and intensely salty. Herbs are ubiquitous: think of them as the vegetarian mainstay of many meals, used as garnish, in pastes and as vegetables in their own right. Fermentation, from garlic to tomatoes to jonjoli adds another set of astringent vegetable notes to the table. Spice mixes, wet and dry, such as adjika and svanetian salt, provide a unique heat to the cuisine, relying as they do on combinations of garlic and chili, as well as dried spices such as the indigenous blue fenugreek, and ground and dried marigold petals. But what is truly enlightening is the effect that these have in combination. This picture of astringency and bitter flavours, tannic wines and intensely salty cheeses, when tasted together, produce an utterly harmonious taste experience. The sharp edges give way to a rich, intense palate, all coming together as a complementary whole. and utterly rewarding. After almost six hours of leisurely indulgence, continuous wine tasting and conversation, the day ends. Georgia: Kakheti East of Tbilisi. Zangaura Picnic: Georgia’s Food and Wine Culture. Having dipped a toe in the Balkans last year, this year saw an unusual attack of adventurous spirit take hold: Georgia could wait no longer. From Old Tbilisi and its narrow streets, evocative of a way of life not altogether lost, to culinary and wine tours of Kakheti within sight of the Russian Border, and Tbilisi’s markets; from Tbilisi’s oldest church with its exquisite choral services to one of the countries oldest monasteries overlooking the Azerbaijan and Armenia borders: Georgia revealed its beauty and culture with an easy and open mind. When I lived in Moscow, it was the regional food of the Caucasus that caught the attention: interesting breads, tart flavours, nut based sauces and pastes, vivid colours. Tkemali, Khinkali, Khachapuri, Lobio, Lyulya kebabs, Jonjoli, Pkhali, Churchkhela - names to conjure with, techniques to puzzle over. The Supra: legendary hospitality, centering on an ever-replenished table of dishes. Wines, well, Georgian wines were difficult to come by in Putin’s Russia and therefore left untasted - noses cut off to spite faces: Rkatsiteli, Saperavi, Kisi - unheard of varieties. Qvevri: huge amphorae, up to 1,200 litres, buried in the ground, a resurgent industry using ancient natural fermentation processes taking up to a year. Amber wines: no longer white after six months of contact with skins and stems. Chacha: Georgian brandy, distilled from the lees of these wines. A week-long introduction to all these delights and more was the reward. High expectations were exceeded by a mile. Openness, hospitality, engagement: in a poor country, the humanity stood out in stark contrast to the self-absorbed pursuit of material advancement that characterizes so much of Western public life these days. Over the next couple of months, I’ll share these stories. I have added a Georgia page to my website here, and added some more to the food and wine and still life pages. Take a wander through them. And if you haven’t already, download the Steller app on your phone and follow these stories in full there or click here. For this first glimpse, though, some things to whet the visual and literal appetite. If this is later than intended it's because I've been wrestling with how to express my thoughts in the aftermath of a visit with my brother and sister to the Scottish Borders in late June . We had assembled in Melrose to perform a small act of remembrance on behalf of our parents. At the same time I introduced my partner for the first time to the delights of the place where I grew up. Portentous stuff, eh? Potentially fraught with emotion, but fun times as well, all in the Scottish sun. And in the end, a simple family affair. "Flora Colledge (F30-34) was the fastest British Age-Group female athlete – and the second fastest across all nations – to add ITU Long Distance Gold to ETU Powerman Middle Distance Duathlon Gold (also in Denmark) earlier this year, and the same at the Zofingen ITU Powerman World Champs last year. Now, given that Flora also won the SWISSMAN Xtreme Triathlon (overall) just three weeks ago, quite a talent. Being called ‘Flora’ in triathlon currently carries some value, clearly!" The second, a couple of hours later, in Flora's own words on Facebook. It is this that pushed the June experience into its proper context. To Flora, I offer congratulations for her dedication and perspective and achievement; and condolences for this simple expression of her family's loss. Leave a comment for her on Facebook if you like. The passing of the Colledge name from the Borders with the death of my mother in March doesn't change a thing. Here we are dedicating a favourite flowering crab apple tree at the Borders Crematorium in the lee of the Eildons, in memory of Jim and Margaret. 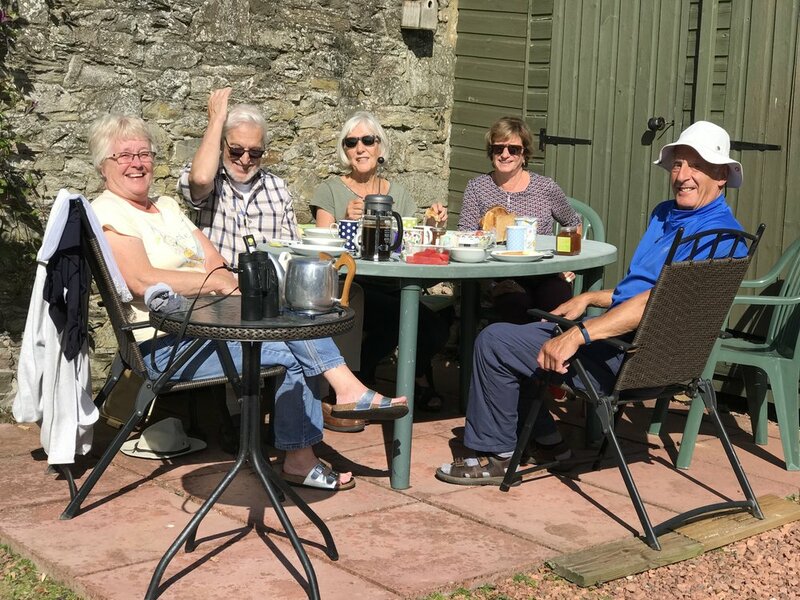 And in the lead photo, a reminder that family life in Scotland continues: there are cousins to visit and partners to travel with - and things to see. Only the sunshine is a bit misleading! Flora's message reminds me of friends and their families too: To Doug and Brenda, to Claire and Colin and to Barrie, all of whom have personal experience of the trials and rewards of family life in the past little while, and for all of whom family life goes on. See you all here or there sometime soon. ...And at Dryburgh, Sir Walter Scott lies under the arches, accompanied in the area just in front, by Field Marshal Earl Haig of Bemersyde, until recently bête noir to WW1 historians. The Borders abbeys are one of the delights of the region. Impressive as historical monuments, evocative of the scale and power of the Church in the case of Melrose, introspective and imbued with a sense of the cloistered life at Dryburgh. They have also served as the burial grounds for the famous and influential. "The Camargue horse is the traditional mount of the gardian. It is used for livestock management, particularly of Camargue cattle, and also in competitive Camargue equitation, in traditional activities such as the abrivado...Their calm temperament, agility, intelligence and stamina has resulted in these horses being used for equestrian games, dressage, and long distance riding..."
I'm not an equestrian; I'm allergic to horses, cats and various other forms of dust-blowing, pollen-laden life, such as Bori.... no, strike that. But I like them (maybe not the last). However when I first saw the abrivado in my home town of Uzes, I was taken by the apparent extent of the cultural attachment the gardians have to their animals and way of life. Colourful, skillful, a bit dangerous, no doubt controversial, it is an annual ritual across the towns and villages in the South of France around the Camargue. Not only the fastest, not only the one who got the bull home untouched by the chasing locals but prizes for the best-dressed, best liveried! It's my horse! It must be! From these beginnings three years ago, a project was born. You can see progress here. Subscribe to my blog here. And new flower and garden shots here. This year I entered the Pink Lady Food Photographer of the Year 2018 competition , following general encouragement of the 'nothing to lose' variety (I assumed, self-effacingly) from serial winner and free radical photographer Tim Clinch (http://www.timclinchphotography.com/). Two of my shots were then shortlisted [WHOOSH, blood rushing to the head; quick make hi-res copies you're going to need them. Where are the finals, in London? Get speech ready, ditch it, ad lib, keep your cool!]. It's the first time; how else do you react? The Finalist images for Pink Lady® Food Photographer of the Year 2018 have now been selected and successful Finalists have been informed. While your entries made it through into our Shortlist, I am sorry to inform you they have not progressed further in this year’s awards...."
Taken in Bulgaria last year during a wonderful 5 days, hosted and guided by the Clinch himself. NEXT YEAR, this little Scottish piggy is going wee wee wee all the way home to the finals in London! And I get to put a new page on my website: RECOGNITION!!! When I get round to it. The garden's coming on nicely this year. These taken in the gentlest of morning light this week. A declaration: this one is personal. Decay has a certain beauty, but when it is associated with a mid-20th century architectural masterpiece it brings only sadness. The photo above is but a detail of the Grade 'A' listed Klein Studio that sits in wooded parkland between Galashiels and Selkirk in the Scottish Borders. Unfortunately, it is also "Buildings at Risk" registered. My parents were close friends of both Peter Womersley and Bernat and Margaret Klein. To have visited their homes, to have grown up with the fierce intelligence and cultural engagement that both Womersley and Klein brought to the table and to have had the privilege of their friendship and generosity, were gifts of lasting importance. the building sitting in its environment seamlessly. To this day, the reflections of the setting in the glass of the studio walls, and the sense of looking through the structure to the Borders countryside are thrilling. Most of all, having experienced Womersley's and Klein's creative output as it happened has left me with a deep appreciation for the impact of good design in the best and broadest sense. This influence, preserved in the physical form of theses architectural works of art, should not be lost to future generations. The Studio was sold by the Klein family in the 1990's. Used then as the home of a local government - sponsored project to ameliorate a dependency of the Borders economy on a declining textile industry, it was in the early 2000's sold again, into private hands. There has been a recent uptick of interest in Womersley's work. Professionals, academics, prominent representation in the 2015 year of Scottish architecture, tours, lectures, papers, university projects, Historic Environment Scotland, social media presence and so on. And still nothing. Somewhere in all of this, a dialogue with the owner, an understanding of the difficulties and obstacles, a reexamination of the "repurposing", a sense of the possible is it seems to me, subjectively, to be missing. In short a place where all of these disparate threads of interest might find a simple collective expression of broad public concern that could lead to the shining of a little light onto this bleak picture. We ask for nothing other than that you take a moment to sign up to the website. We are neither fundraising nor sharing personal data. you come across an abandoned site populated by the shells of concrete buildings. At first, all you can see behind the low dunes and their retaining fences are the rooflines. Soon there appears a hint of graffiti, so you step closer. This is the month in which Ursula K Le Guin died, an author I have often been recommended, but have never read. My science fiction reading is limited. To the extent it exists at all, it is the world of Nevil Shute's 'On the Beach', John Wyndham's 'The Day of the Triffids' and Ultravox's 'Dancing with Tears in Your Eyes'. So I know there is a post-apocalyptic world out there and it's lurking behind these dunes, and this is the week it found me. Better get reading. It's a world of sylphidine figures emerging from the walls, missing eyes and limbs, consumed by empty doorways and windows; it's a place where the vegetation, starved of affection and care and water, reaches out to the lifeless structures; where the interior world is bereft, an exposed wound, waiting for its demise. Returning to the beach, you realize the seemingly eccentric picnic, guarded over by the bald biker who checked out the stranger wandering amongst the buildings, is more likely a wedding, styled with found objects and strange outfits, a guest list of survivors; a wedding whose protagonists are a modern couple in spite of their dress, hoping for happiness but offering little hope for humanity's survival - without the hairless biker, that is. As it turns out, the site is an abandoned hospital, turned over to nature in a sad commentary on human ingenuity: it contains asbestos, making the buildings not only unusable, but the site too expensive to safely redevelop. Some playground. And on a happier note, winters are not only crisp sunny days, but delicious bitter salads. two or three blood oranges, saving the juice that runs free to make a vinaigrette by adding your favourite sweet or savoury condiment such as pomegranate molasses or a flavoured syrup; add sugar to taste, salt, pepper and olive oil. some very thinly sliced red onion in lime juice and a little sugar for an hour. a small head of trevise into a shallow wide bowl; add the pickled onion and orange to the bitter leaves, drizzle with vinaigrette - and take a photo or two or three as you eat! We just spent another restful and happy Christmas with my niece Flora and her partner Felix Köhler, chez ma soeur in the shadow of Mont Bouquet near Uzès in the Gard (find them on Instagram @floracolledge and @felix_koehler_duathlete respectively for more pictures of punishment and reward). I enjoy my sporting life vicariously through their accomplishments of which I am inordinately proud: she is an ever-accelerating triathlete with an increasing number of notches in her belt; he is the current European Duathlon champion. He was out of sorts on the day of the world championship in 2017 having come off his bike at 90 kph 10 days before, onto a road of sharp gravel. This, as he said, disrupted his training schedule a bit, or I might have been writing something else here. What I can't quite wrap my head around is the enthusiasm that is given to the relentless training schedules they both endure. On Christmas Day, for instance, Flora's remote trainer (remote in the sense that he was lounging on an Australian beach when he emailed her her daily grind) was required to do a mere 3 hours on the indoor bike: the resistance was high, but not from Flora, just from the infernal machine to which her bike was tethered. Felix had completed a 12k run before elevenses, adopting a pattern of timed fast/slow repetitions of varying lengths (they both eat like horses too, grazing at every opportunity), and would go on to do another 18 just for kicks before dinner. What they don't often get is a chance to train together, so these shots are for them. So what do racehorses do on Christmas Day? They eat too much of course! Or was it last year. Having decided to sneak out from under the cover of privacy and share something of my photographic life with others, and having attended a workshop (timclinchphotography.com), and having been disabused of any notion that you can win a lottery without buying a ticket, and having taken the sting of criticism and blushed in the warmth of muted praise, I got home and bought a domain name. ...received a renewal notice for the domain name I had saved last year. This, being late October, serves notice that I have now Done Something About It. The result is here for all to see, although not all the creatures in the vast internet sea appear to have realized it. I hope, if you see this, you will share it with others. Or contact me. Or give it a Like. Apropos of nothing, visited the Parc Ornithologique du Pont de Gau in the Camargue yesterday. Gotta like the way flamingoes create patterns.